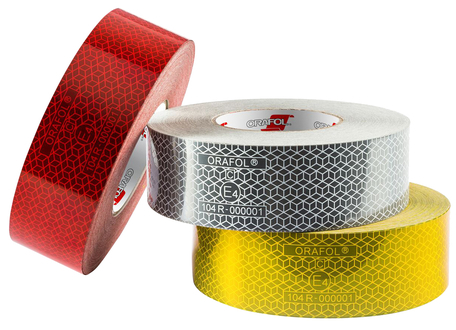 Reflexite® by ORAFOL is the leading product brand within ECE104 approved marking tapes. The Reflexite® brand reflective tapes are known for being not only safe and visible from up to 1000 metres away, but also tough and durable as well as easy to apply. The Reflexite® VC104+ range includes a complete product line for application onto rigid bodies, onto circular tanker shapes, as well as onto curtain sided vehicles. Exact layout of the tape will depend on the design and intended use of the vehicle. Technical details are contained in European regulations on vehicle lights, paragraph 6.21 of UNECE Regulation 48.03.